Turn your existing planters into Self-Watering with our amazing Drop and Grow Insert. Completely self-contained, it functions and performs exactly like our industry-leading containers. There’s no additional holes to drill in your existing planter, just drop it in, fill and you’re ready to average 2 weeks between watering cycles. A solution that will save you 50-80% in Labor, Fuel & Water Usage versus planters without our insert. And they’re fully winterized, so they can remain in your planter year round! 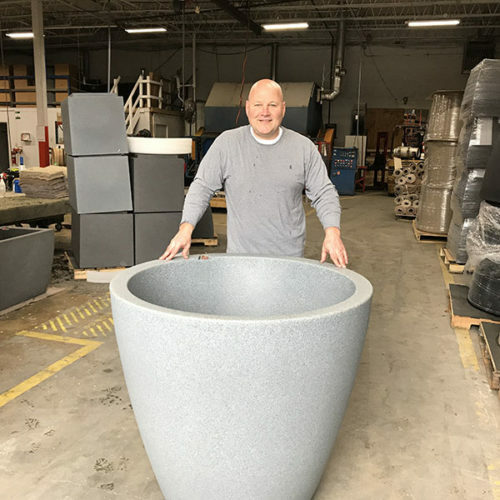 Fits many Steel Planters manufactured by Du Mor, SiteScapes, Victor Stanley, and others. Can be placed in containers of various shapes and material. It’s important to take careful measurements to ensure the proper fit. 17 ½” H x 21 1/5” Top Outside Diameter. Height can be adjusted by placing material such as bricks or stone under the unit.